Ahhh is there anything better than getting that little black box in the mail? I am here to show you some gorgeous luscious red lips with MAC’s Toledo collection, in the color “Opera”. I don’t think anything smells better than a fresh MAC lipstick, I say it smells like chocolate, my daughter thinks vanilla, it may be a choco-nilla scent. In any case, it smells like candy and is awesome. I had to put it on right away, thus the lack of my full face because I was not up for doing an entire face of makeup today, but here is MAC Toledo Lipstick, “Opera” a stunning red look that no one can pass up! Beautiful isn’t it? I love it! It goes on super creamy and amazing, but has a perfectly matte finish – but not super matte like their “retro matte” sin lipstick. When I was first putting it on, I thought, “what finish is this exactly?” It wasn’t quite a cream, but didn’t quite feel like a matte either, but it is listed as “matte” and I LOVE it. 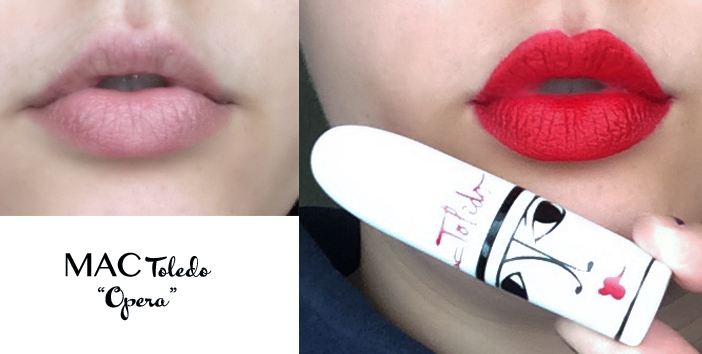 It’s literally the perfect consistency for lipstick, I wish every lipstick could be this way, it’s awesome. Did you pick up any of the Toledo collection? I’d love to see your looks!